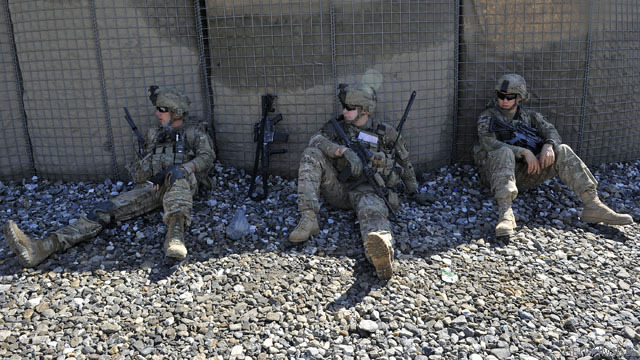 US army soldiers from Bravo company 2nd Batallion 27th Infantry rests before a mission with the Afghan army at Outpost Monti in Kunar province, on September 20, 2011. Washington (CNN) - As the war in Afghanistan passes the ten-year mark, a new national survey indicates that support for the conflict has dropped to an all time low as a growing number of Americans express concern that the situation in the central Asian country has turned into another Vietnam. According to a CNN/ORC International Poll released Friday, only 34% of the public says they support the war in Afghanistan, one point less than the previous low of 35%, with 63% opposed to the conflict. The survey indicates that 57% say it was not a mistake to send military forces to Afghanistan in October 2001, several weeks after the September 11th terrorist attacks. But according to the poll, 58% now say that the war in Afghanistan has turned into a situation like the U.S. faced in Vietnam, six points higher than the number who felt that way a year ago. The survey also indicates partisan and gender gaps over the conflict. "The war in Afghanistan is perhaps the one remaining policy on which President Obama and Republicans agree," says Holland. "Six in ten Republicans still support the war, compared to only a quarter of Democrats and independents. Support is also much higher among men than women, although a majority of both groups oppose the war." The poll was conducted for CNN by ORC International from Oct. 14-16, with 1,007 adult Americans questioned by telephone. The survey's overall sampling error is plus or minus three percentage points. Good to see people finally using their heads. Supporting war makes you yourself look like a warmonger, so then the question arises, what makes the United States of America better than any other country at war? Nothing, soldiers killing other soldiers, and yet so many people in the west believes they are somehow "better" than the guys fighting on the other side? Enough is enough, USA, off of your high horse right now, just like the mission where Osama Bin Laden was taken down this is despicable. We'll be in Afghanistan only until Obama decides to leave or is no longer President. The nuts who would revolt in the streets are his political base. We have more than accomplished the original mission. That's reason to pack it in and withdraw in an orderly fashion. We underestimated the people of the region and their objectives. That's reason to pack it in and stay awhile. Q. Do we stay or do we go? I guess the word got out about our US troops being used to protect the heroine trade. So that when it is turned from poppy to drug and shipped to the US, the government agencies can bust Americans who buy it and increase their revenue in the private penal system. Who needs enemies with friends like those in US government? Kick them all out, they are traitors, and worse they are evil. End the drug war, and the war in Afghanistan ends as well. Regardless of what the polls says, we can't withdraw from Afghanistan early. As long as Pakistan is harboring terrorists within their borders, we need to be in Afghanistan to tighten the neuce on these terror networks such as Al Queda and the Haqqani network. Karzai needs to go and we need a non corrupt leader of Afghanistan. The war will be lost if we allow the Taliban to seize power of the country once again. I'm all for what the Vice President wants which is a counter terroism strategy. The counter insurgency days are over. It's time to bring the fight to them wherever they may be. As long as the CIA needs the drug money to fund black ops, we'll be in Afghanistan. We need to know more about Cain's links to the neofascist Koch brothers. His campaign manager came from their organization. These soliders in the photo are clearly union, sitting around like that. Seems like America has finally come around to the position I've held for 10 years. And to think, I was heckled by lots of people when I stood on the Capitol steps with a sign protesting the Iraq and Afghanistan wars. Anyone with half a brain, and the experience of Vietnam, could see where that mess was headed. Eventually, the people who can stop the war will catch up with me and the rest of America. But that won't bring back the thousands of people killed for no reason, or the billions of dollars wasted. Don't waste your time – he's a full time Obama rump swab. God Bless our troops and send them home safely. This war needs to end and end now. Please Mr. President END THIS WAR NOW. This is yet one more mess W left to be cleaned up. This country doesn't need anymore republican presidents for at least the next 10 years. Bet if Bush were president you wouldn't be posting this. I'm sure you would be yelling what a warmonger Bush is. WRONG!!! I've always stated that this was the war we should've been fighting all along and NOT Iraq. Bush dropped the ball and took his eye off the prize which was Osama Bin Laden. I recall him giving up the hunt for OBL so he can go on his decietful, revenge crusade to get Saddam. Leave it up to a black man to clean up a white man's mess. What GOP disinformation sweat shop do you work for ? You are the same guy writing for three ! Who's idea was it to go into Afghanistan "BUSH" . he met his 'campaign manager'. I think it's time to leave Afghanistan. Bin Laden is dead, new trbal unrest are emerging, it's becoming a domestic problem now rather than international. It's difficult to fight a religeous war, learn from Ireland where the figghting lassted centuries and still goups of people are still causing distrubance in the country. People fighting a religeous war have a mindset of pre- civilized world. They don't know anything about the 21st century world. It is their own problem now, it's up to their people to decide wether to catch up with civilization or not.